Email and photos published with the kind permission of Mr Hendrik J Nobel. While it is not normally a habit of mine to follow Internet blogs, yours has become a favorite. 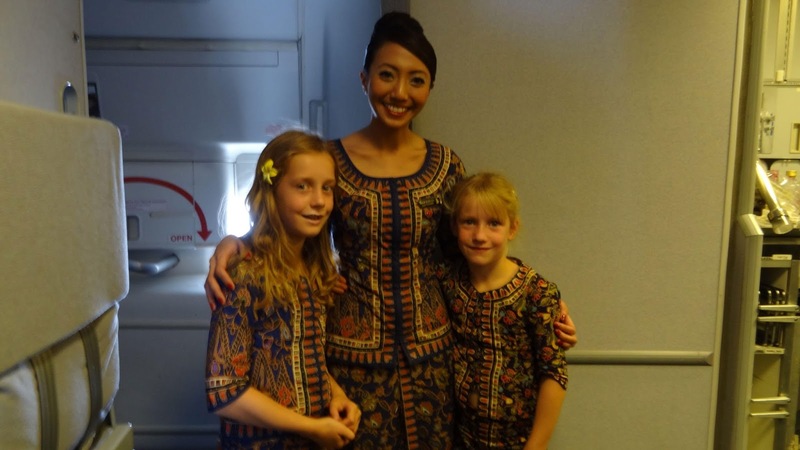 Since 1988, I have been on many flights with Singapore Airlines. In these 27 years I have been constantly impressed by the fact that the airline would always be the first to offer the newest type of aircraft and in-flight services. Always setting and raising the standard for the entire airline industry, without ever really being beaten by the competition. What an incredible achievement that is. But my greatest admiration goes out to the ladies & gentleman such as yourself. 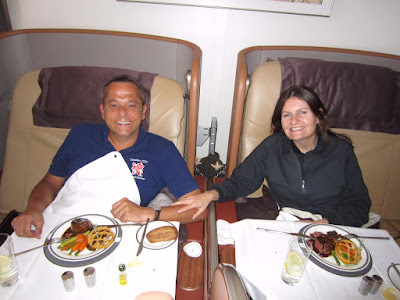 Always offering impeccable service, regardless of which of the available cabin classes my wife & I traveled in. Having read many posts on your blog, I realize even more how tough the cabin crew training is and how hard they have to work to offer the excellence we have always experienced. On top of that, we have so much respect for the way they deal with sometimes very rude and unfriendly passengers. Uncivilized people like that should once try any other airline and see how they are treated there. They will undoubtably notice the big difference. At the age of 20, I saw the first Singapore Airlines television commercial in The Netherlands. I saved up money from my student job, to book my first intercontinental flight from Amsterdam to Singapore & Medan with Singapore Airlines. As far as I can remember, with stops in Abu Dhabi and Malé, taking well over 18 hours, nowadays only 12. That first flight was the start of a long and warm relationship with SIA and it's wonderful crew members. Many trips followed, since my wife and I are passionate travelers. Our flights frequency increased even more when we moved from The Netherlands to Hong Kong in 2011. Whenever we travel to Europe or the USA, we rather fly a few extra hours through Singapore then take a direct flight from Hong Kong. As poor students we started of as Krisflyer Blue Members and a few years back made it all the way up into the PPS Club, hopefully without becoming PITA passengers for the crew. We actually have flown hardly any other airline for our travels. The choice of our holiday destinations is also often based on the Singapore Airlines destinations charts on the company’s website. We always look forward to see the Golden Kris on the aircraft’s tail at the departure gate and meeting the crew at the door. We have seen several talented cabin crew members grow from Flight Steward or Flight Stewardess all the way up to Male or Female In-Flight Supervisor. Therefore it almost feels like coming home to a part of our family whenever we step aboard. In Amsterdam, we used to live just around the corner of The Marriot Hotel, often seeing the crew wait outside for the crew bus, when we were cycling by to get to work. Especially in the cold Dutch winters, we would feel sorry for the ladies in their thin kebayas. Through these years, we have tried to help in advancing the careers of exceptional cabin crew talent by requesting their full name so that we could send positive feedback to SIA. The customer services department always replied and ensured us that our feedback would be forwarded to the cabin crew management department. I hope that has been the case and that we have been able to assist in pushing cabin crew members through the ranks. A few years ago I purchased two Little Singapore Girl suits for my two little nieces in Kris Shop. A few months later, they wore them during their first ever flight, taking them from Amsterdam to Christchurch and back. 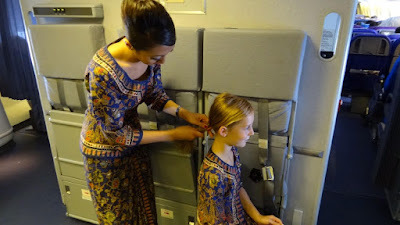 The Male In-Flight Supervisor came over and told them jokingly that since they were wearing the kebaya, they would need to work as a Singapore Girl. One of the Flight Stewardesses even tied their hair in a bun, so that they would comply with the companies policies. They assisted in handing out snacks to passengers during a part of the flight. They still talk about that during family gatherings. Another perfect example of the warmth of many of the cabin crew members. Because of all of this, I wanted to send you an email. As an acknowledgement from two travelers, for all that you and your many colleagues have done for us throughout the years. Sincere thanks and good fortune to you and all the people that work and have worked so hard for their passengers. It has been a privilege flying with them in the past. I am looking forward to many more flights with them in the future. I forgot to mention one thing that my wife & I always say: "There are many carriers, but only one airline: Singapore Airlines". BT is still a loyal supporter of SQ. He put up this blog post to counter all the negative postings in the ST forum. Well done my friend!